It’s a shame Rock of Ages has turned out the way it has, because I can’t recall the last time I saw this much imagination implemented so well in a game. It comes with the obligatory time trial and smash-things-for-points modes, but nobody cares about those. The real game is to be found in the War mode, which involves two players setting up a series of defensive obstacles on the opponent’s track and then racing a bloody great boulder down it while attempting to avoid said obstacles. When the boulder reaches the enemy castle it gets rammed into the gets, buckling them and causing damage depending on how big the boulder is (it can be whittled down when it takes hits from defence works) and how fast it’s going. 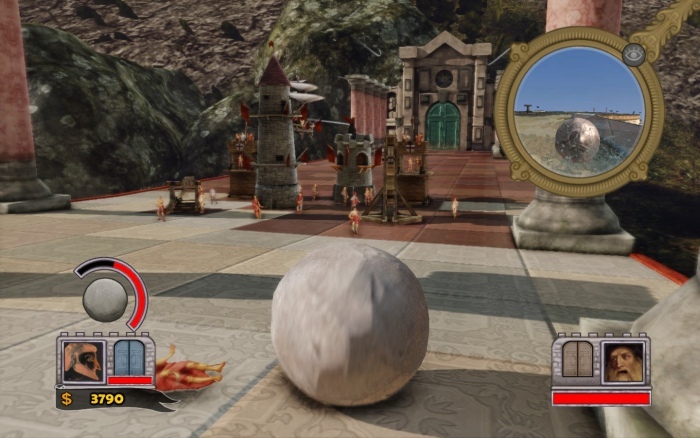 Once the gates are busted open there’s nothing else standing between your rock and your opponent’s very squishy avatar. This is a perfectly sound concept for a game. Doubly so considering the way Ace Team have gone about it; each set of levels is based around a certain age of history – Medieval, Renaissance, Baroque – and the CPU opponent takes the guise of various historical figures appropriate to those epochs while the developers take the piss out of them in fantastic Python-esque animated cutscenes. These are completely insane, which is a good yardstick to measure the rest of the game by; the various missions had me deploying elephants and cow-powered fans to push the CPU boulder off the track, while the bossfights included a memorable encounter where I had to fire my rock out of a cannon at the (sadly figleaf-covered) crotch of a giant-sized Michaelangelo’s David. Which was firing its own cannonballs at me. The whole thing is excellently realised in terms of production and polish. Every epoch has its own appropriate art style and background which takes in actual famous works of art from the particular period: on one of the rare occasions I had my boulder stopped I noticed one of the tiny figures scurrying away from it was actually Botticelli’s Venus. The orbiting sun is rendered first as a simple picture, then as a crude sundial, and finally as an elaborate orrery. The music is superb; I don’t know classical music well enough to spot how many actual period pieces they’ve used besides a particularly appropriate implementation of Dies Irae and the Ode to Joy, but it’s all fantastic accompaniment to watching an enormous boulder hurtle down a racetrack. So why is it disappointing? Despite there being 20-odd levels in the game it took me just over two hours to get through the lot. Out of those 20 levels there are three that I didn’t manage to complete the first time through, and I got all of those on the second try. And this is where Rock of Ages runs up against its major flaw: it has practically zero replay value. The Story mode had no challenge to it whatsoever. Once I’d beaten the computer opponent on a level – a task that in most cases took less than six minutes – that was it and it was time to move on to the next one since there was nothing else to do – no difficulty level, no challenges, no medals, nothing. I dabbled in the time trials and skeeball modes for a while but my heart wasn’t in it, since those modes had very little to camouflage the fact that I was just rolling a ball down a hill really fast for no real reason. Of course Ace Team have recognised Rock of Ages’ limitation here and have priced it at a seemingly reasonable £7 in response. Is that worth it for 2-3 hours of entertainment? I’m not sure. I’m leaning towards a grudging yes mainly on the basis of the production values which make the game great fun to play while it lasts, but all the polish in the world can’t quite allieviate the lingering sense of disappointment RoA has left me with. And any game which makes me feel that way has to be considered something of a failure. An ambitious failure, an imaginative failure, a funny failure; but a failure nonetheless.